RENSSELAERVILLE – Robert Lawrence Bolte, 73 passed away peacefully at home with his wife and daughter by his side on Sunday, March 5, 2017. Bob was born on August 14, 1943 in Tomahawk, Wisconsin to the late Alma and Thomas Bolte. 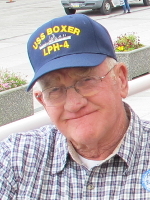 He joined the US Navy in 1961 where he served on the USS Boxer until 1966. His rank was Electrician 3rd Class. After leaving the Navy, he started his own electrical business, Bob’s Electric. He began working for Bryant’s Super Inc. in 1980 and served as their maintenance and repair man and became the right-hand man for the Bryant family. Bob served on the Rensselaerville Town Board for many years; was named Volunteer of the Year in 2015. He single handedly raised the money for the town to purchase the Senior Bus; and designed, created and maintained the Veterans Ring of Honor at the Rensselaerville Town Hall. His generosity and kindness towards friends and those in need will be missed. He had many interests and could do ANYTHING. The list of talents and abilities Bob had is incredible. He may have ruffled a lot of feathers throughout his life but he was dedicated to doing the right thing for his family, community and country; often times not the easiest of decisions but with an authentic, genuine “Bob” approach. And with the intention of making America Great Again. Bob is survived by his wife of 49 years, Karen Julie (Bodi) Bolte. They were married June 24, 1967 in East Greenbush, NY. They built their own home in Rensselaerville, NY in 1972. He is also survived by his daughter, Elaine K Sargent, her husband Mark Sargent, grandsons Evan and Ethan of Powhatan, Virginia; special nephew Dave Bolte and his family of Brimfield, Mass; sisters Darlene and Dorothy; brother Eugene; and numerous nieces and nephews. He was predeceased by five sisters and five brothers. Bob generously donated his body to the Anatomical Gift Program of the Albany Medical College. In lieu of flowers, the family is requesting donations be made to the Rensselaerville Senior Bus Fund or the Veterans Ring of Honor Fund. Checks can be made payable to the fund you choose, and sent to the Town of Rensselaerville, 87 Barger Road, Medusa, NY 12120. Relatives and friends are invited to attend a memorial service at the Westerlo Reformed Church in Westerlo, NY at 2 p.m. Saturday, March 11th. A reception will follow the service at the Fellowship Hall. The family is asking attendees to wear red (clothes, jewelry, feather, etc.) in honor of Bob – it was his favorite color. To leave a message of condolence for the family, please visit www.HansFuneralHome.com. We are saddened to learn of the passing of Bob. Our most sincere condolences to the Bolte family. Shipmate you stand relieved….we have the watch. Ring the Ship’s Bell: Electricians Mate Third Class Bolte departing. Bob was truly a man for all seasons and for many reasons. He touched countless lives with kindnesses and took very little praise for doing so. He will be sorely missed. Our condolences to Karen ,Elaine and the Bolte Family. Bob’s legacy as a Patriot, his concern for our Veterans and his fellow man and his generosity to anyone who needed a helping hand will be sorely missed.